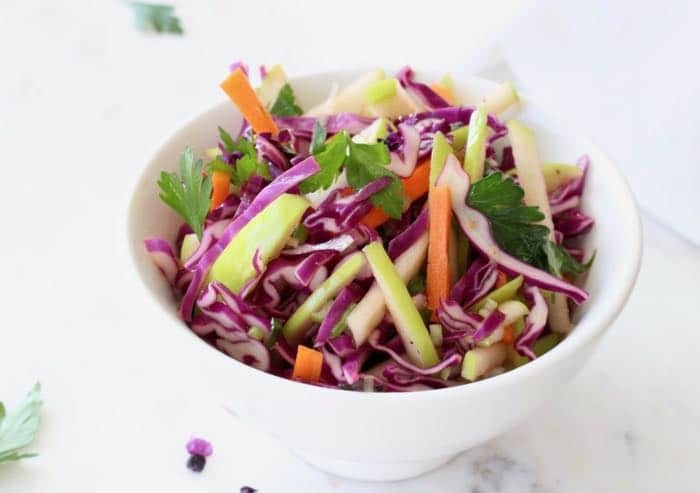 Light and easy green apple coleslaw recipe with a little kick from red pepper flakes, a perfect combo of fruit and purple cabbage dressed in a tart apple cider vinegar dressing. Healthy and delicious, no mayo, no sugar, ever! 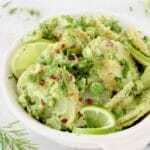 This green apple coleslaw is so easy and can be adapted to the ingredients you have available. Out of Granny Smith apples ? No problem, use Honeycrisps instead or whatever variety you have and toss it well in fresh lime or lemon juice. 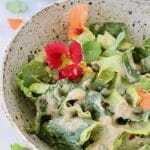 Make it with pretty purple cabbage, green or a mix of both. Add some sliced bell peppers in there if you like, make it your own. As soon as you cut the apple make sure to squeeze some fresh lime juice over the top. The acid will prevent oxidation so therefor browning. Packs well in a mason jar to bring to a potluck, lovely served as a side dish or piled up high on these vegan pulled pork jackfruit tacos. So delicious! 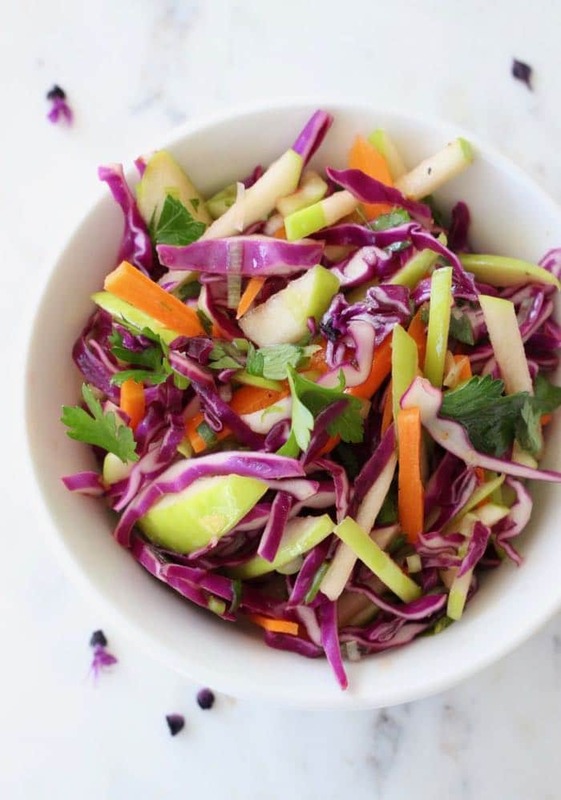 good to know: “ An apple a day keeps the doctor away ” a cliche backed up by modern science, so eat your apple or your apple coleslaw. Win-win! P.S. If you made this recipe please remember to come back and brag about it! 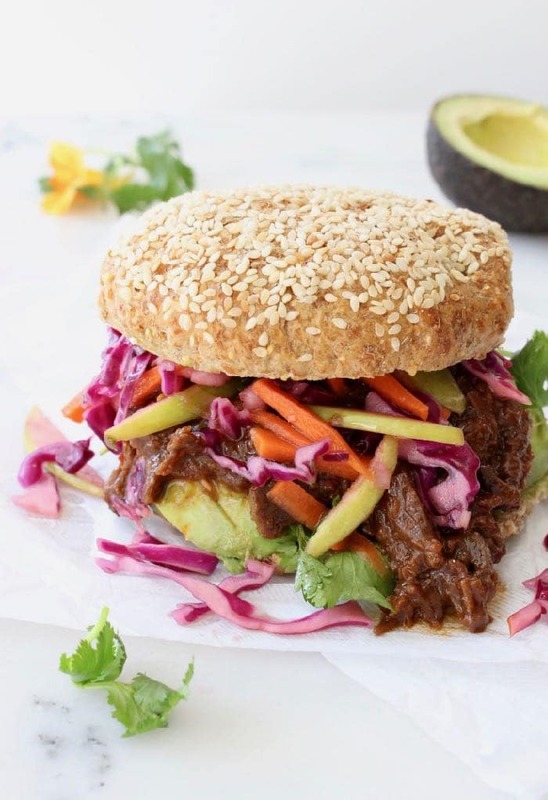 Rate it in the comment section below, snap a photo ad tag us with #VeggieSociety on Instagram, it totally makes my day! In a small bowl whisk together the apple cider vinegar, maple syrup and olive oil until emulsified. Season to taste with the sea salt and red pepper flakes and set aside. Cut your apple into thin sticks and hit it with a squeeze of the lemon to prevent oxidation / browning. 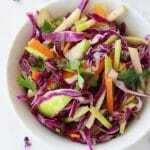 Place them in a mixing bowl together with the shredded cabbage, carrot, parsley and scallions. 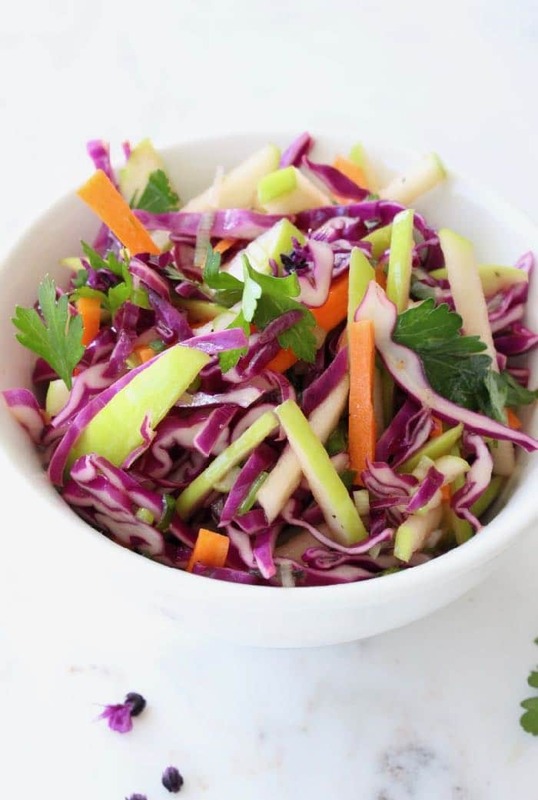 Pour the apple cider vinaigrette over the coleslaw and toss to coat well. Taste and adjust seasonings with sea salt. Serve chilled. Optional: add a handful of dried cranberries, cherries or raisins into the mix. Experiment with some jicama, sliced grapes, walnuts and poppy seeds. Find what rocks your tastebuds. Enjoy! 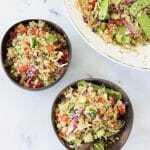 Great recipe to make all summer long. We topped our Beyond burgers with this and it was fantastic!